Arenal Volcano stands over the pleasant, green country town of La Fortuna Costa Rica. La Fortuna has grown into a charming town of about five thousand residents and has become a favorite amongst tourists. 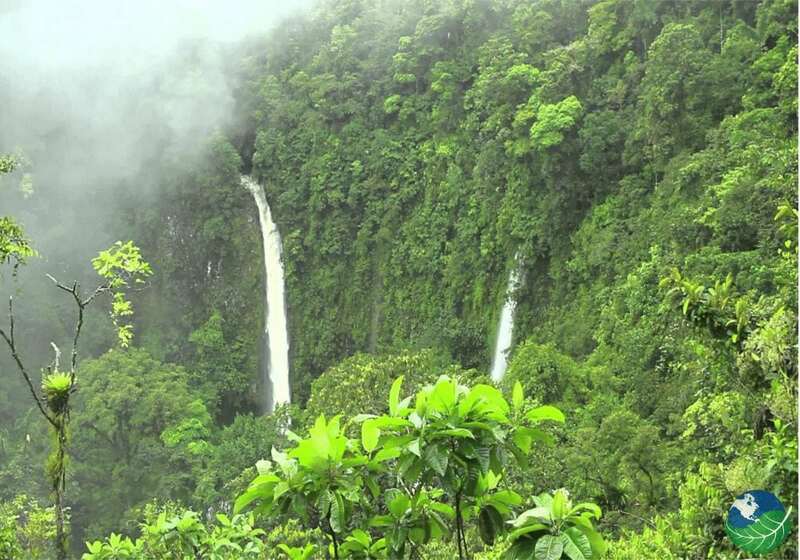 La Fortuna is considered the adventure capital of Costa Rica. Visitors there will find many adrenaline-fueled activities. You can go rappelling down waterfalls and narrow canyons in the jungle. Whitewater rafting tour operators in La Fortuna offer every class of rafting. From river floats to the thrilling class 4+, La Fortuna offers them all. 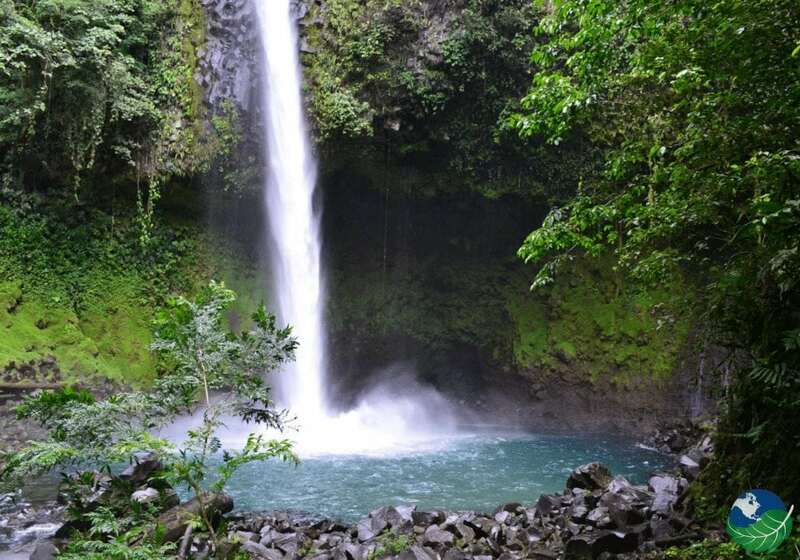 One of the most visited places in La Fortuna is the beautiful and powerful La Fortuna Waterfall. Despite the 15 USD entry fee, this waterfall is definitely worth a visit. The waters are calm and refreshing so make sure to bring your bathing suit! Prepare to get your heart rate up a little with the 500 steps leading to and from the waterfall. Just a little further downstream from the waterfall you can find the Salto Waterhole and rope swing. This natural hangout is a favorite among those wanting to test their bravery. Local Costa Ricans and anybody smart enough to follow them there, find complete relaxation in the natural hot springs. The springs are surrounded by lush jungles and if you are lucky you can spot alive with toucans, dart frogs, crested guans, and hummingbirds. Those wanting to push their trip beyond mere relaxation, can take a challenging hiking tour in the park. This tour combines some of Arenal’s biggest hits. You will see lava-carved landscapes, the Arenal Hanging Bridges and enjoy a cocktail in the hot springs. Along the way your guide will help you spot monkeys and tropical birds. But the best part, you will get a close up look of the 1633 meter, conical giant. When visiting La Fortuna, you will not want to miss a chance to take a ziplining tour. The tours offered in Arenal offers spectacular views of the lake and volcano. For those wanting to push it a little more, the ziplining tours can be combined with the Tarzan swing. Visit the famous Arenal Hanging Bridges for some spectacular photo opportunities. Take a guide to improve your chances of spotting wildlife and otherwise enjoy experiencing the rainforests from the sky! Lake Arenal is the biggest, human-made lake in Costa Rica. It was created in 1979 for hydroelectric and irrigation purposes. The lake actually covers two submerged towns, complete with buildings, roads, cemeteries, and farmland! Here you can enjoy activities like kayaking and fishing. When you visit in May, you will get the best chance to catch the Rainbow bass. From the lake you can enjoy an amazing view of the Arenal Volcano. Dry is season is from December to May: This season will guarantee less rainfall but know that it comes with a lot of tourists! If you choose to travel during this time, make sure you visit places like the waterfall as early as you can. Bring swimming gear: If you want to visit the waterfall or perhaps take a dip in the lake during your kayaking tour, make sure to bring your bathing suit! Bring rain proof clothing: If you plan on taking the volcano hike, it is always best to be prepared with rain proof clothing! You can reach La Fortuna by private transfer for fast, hassle-free travel. You can also take shared shuttles, for a more affordable but less speedy option. If you prefer the freedom of organizing your own schedule, rent a car upon arrival at the airport. If you are traveling from San Jose, you can take a domestic flight to Liberia and travel on from there. For a stylish introduction into local cuisine as well as international options, visit Don Rufino. Make sure to try the Gallo Pinto for breakfast and the Casado for lunch! If you want to try some delicious grilled chicken, go to Pollo Fortuneno. If you are willing to go a little while away from town, you can even dine at the bottom of the volcano! You will find all types of dining here from Costa Rican dishes to Asian cuisine! 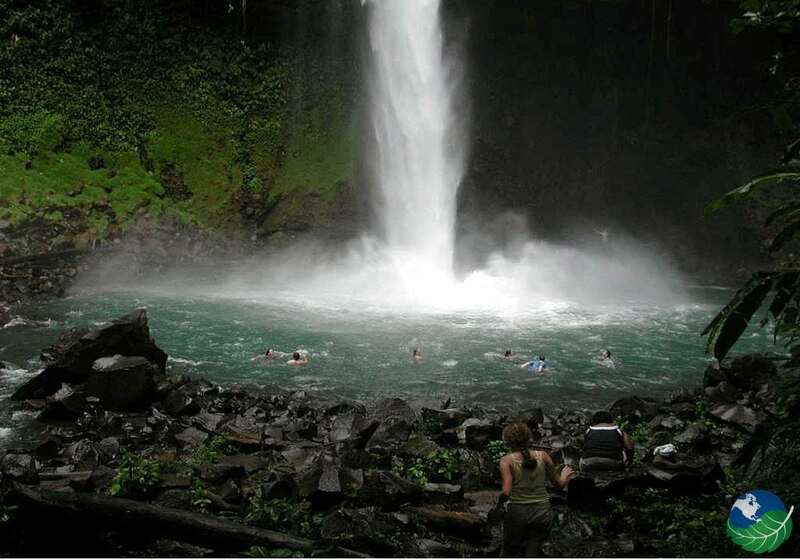 La Fortuna itself is mainly aimed at the casual traveler looking for budget deals. But a little while outside of town, you will find stunning hotels with style and class. Arenal Oasis Ecolodge and Wildlife Refuge possesses a unique and rustic charm and promotes sustainability. The Green Lagoon Lodge is a luxury resort is the perfect choice for couples looking for a romantic getaway. For ultimate luxury in the best all adults resort in the world, check in to Nayara Springs.